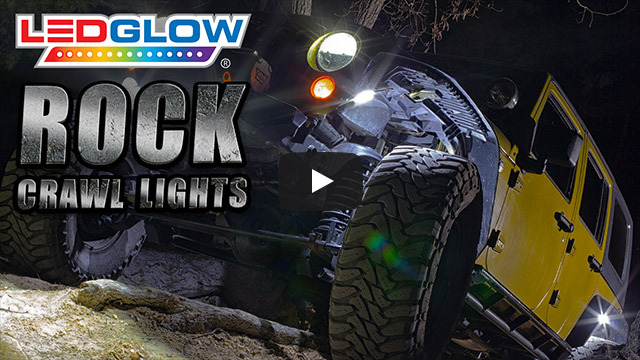 LEDGlow’s Rock Crawl LED Light Kit features 240 ultra-bright COB LEDs housed in 8 durable, waterproof pod lights. When installed in the wheel wells, these lights illuminate the tires and surrounding ground, allowing for safe off-roading. LEDGlow’s 8pc Rock Crawl LED Light Kit fits universally on any 4x4 off-road vehicle, Jeep or truck. With its 240 ultra-bright white COB LEDs, heavy gauge wiring and waterproof construction, this kit is built to last in the most extreme conditions. Each of the 4 sets of 2 durable, waterproof COB pod lights are to be installed in the wheel wells in front of and behind each tire. This allows for greater visibility for the driver to safely navigate off-road obstacles including rocks, mud, water and sand. The lights can be switched on and off from inside the cab by using the included waterproof power switch. Not only can these pod lights handle all weather conditions and any terrain, but so can the pre-wired heavy duty wiring. Each of the 2pc sets of pod lights feature extended wire lengths with 12’ of lead power wiring for the back wheels and 6’ for the front wheels. The 3’ of wire between each pod light allows for maximum mounting capabilities regardless the size of the wheel well. Connecting each light set to the included 7’ y-splitter harness allows for a watertight connection through the use of O-rings and screw cap connectors. All mounting hardware and in-depth installation instructions are included. Unlike standard LEDs, COB (chip on board) LEDs produce a super bright illumination which is evenly distributed across wider areas below the vehicle. Packaged into a flat rectangular pod light, these COB LEDs are very small in size, but pack a powerful glow with a very long lifespan. With 30 COB LEDs featured per pod light, this rock crawl light is the first aftermarket lighting accessory of its kind to feature this ultra-bright technology. The rectangular-shaped COB pods spread far more light beneath and around the vehicle than standard strips, tubes or circular pods, making this kit ideal for intense off road driving, allowing the driver to see obstacles to safely navigate around or over them. just installed this on a 2015 1500 chevy. easy to instal and very bright lights!